Father’s Day’s coming up, and I know a couple of dads that would probably get a kick out of this, as well as find it of use! 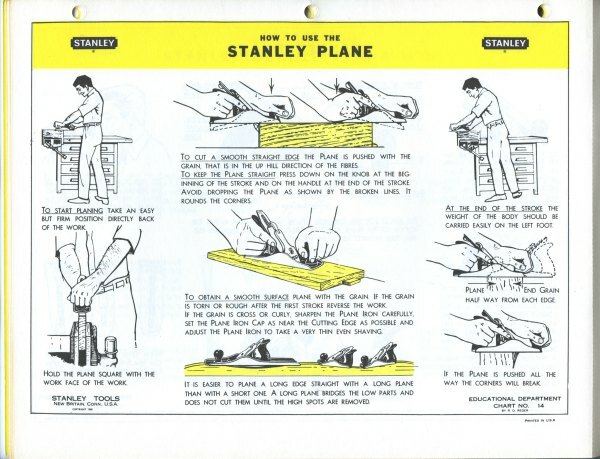 Stanley Works used to publish a brilliant booklet called the “Tool Guide” that contained miniature posters that offered instruction on setup, care and use of hand tools. These booklets weren’t just for woodworkers – you can learn to rivet and create a lock edge on sheet metal with these posters. The 38 pages were bound together, perforated so you could remove them and were pre-punched with holes for a three-ring binder. Last weekend a student in a class handed me a mint copy of the “Tool Guide” from 1968. He was a retired shop teacher and had used them in his classes. What a treasure. I’ve always wanted one, but they can be hard to come by, especially in this condition.